Largo al factotum / Philip Kalmanovitch, bar. Unis des la plus tendre enfance /Isaiah Bell, ten. La ci darem la mano / Jacqueline Woodley, sop., Philip Kalmanovitch, bar. My Tale Shall be Told / Isaiah Bell, ten., Philippe Sly, b-bar. Soave sia il vento / Ileana Montalbetti, sop., Emma Parkinson, mezzo, Philippe Sly, b-bar. Mein Sehnen, mein Wahnen / Philip Kalmanowitch, bar. Si, ritrovarla io giuro / Isaiah Bell, ten. Today's Collaborations at the Richard Bradshaw Amphitheatre was the third time the Atelier Lyrique of Opera de Montreal and the COC Ensemble Studio have come together for a joint recital at the opera house. 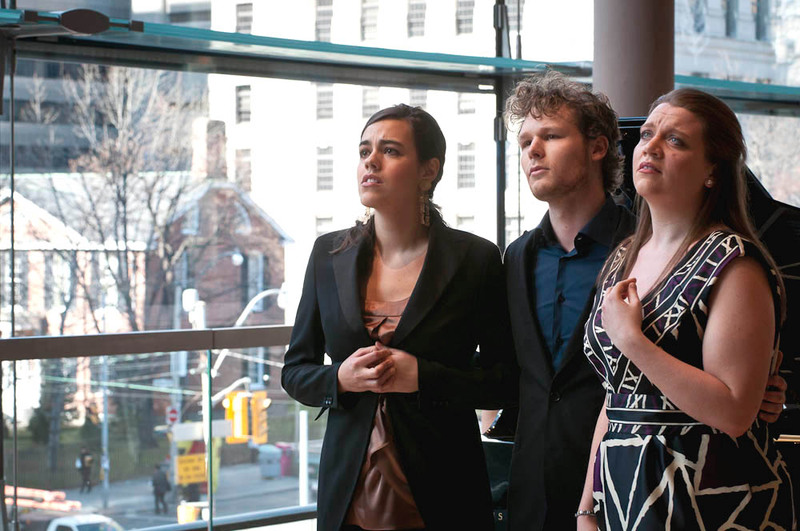 To Toronto voice fans, these concerts represent a nice opportunity to hear the up and coming voices, especially the visitors from OdeM. 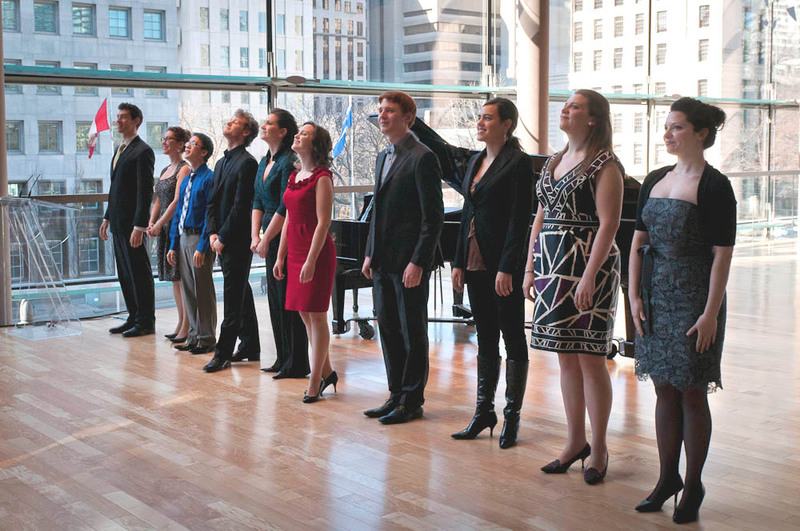 Today, eight singers plus two pianists showed their collective talent to a packed house. Some are more ready for prime time than others whose voices are more works in progress. To be sure, all of them possess youthful, fresh voices, abundant musicality, ingratiating stage presence and the desire and ability to communicate through music, all important ingredients for a future career. They were accompanied by two Ensemble pianists, Jenna Douglas and Timothy Cheung - regrettably their names were left out of the program. Other than a few errant tempi and notes here and there, the two young collaborative pianists acquitted themselves well. Midway during the concert, the Atelier lyrique singers individually went up to the podium for a brief introduction before their solos, all delivered with grace, poise and good humour. It's amazing how much can be packed into a one-hour concert! 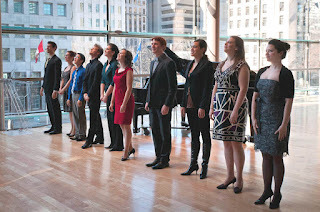 The audience heard a mix of solo arias, duets, and trios, all well known pieces. I enjoyed all the singers, but if I were to single out one soloist, it would have to be mezzo Emma Parkinson, who possesses an outstanding voice. It's hall-filling, supple, rich, dark-tinged, with a golden sheen backed by an excellent technique. With her slim figure and long legs, she would make an ideal Sesto, Nicklausse, Siebel, Cherubino, and maybe even Octavian a few years down the road. Her "Parto, parto" was a tour de force. 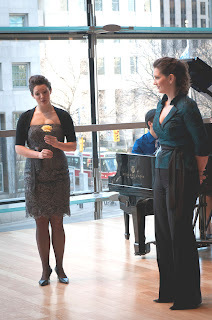 Among other highlights, I very much enjoyed the Presentation of the Rose with Quebec soprano (now COC Ensemble member) Mireille Asselin. A lovely Sophie, Asselin sang with crystalline tone and a firm high C. Her excellent Octavian was Aidan Ferguson, who also impressed as the Komponist in "Sein wir wieder gut" which she sang with just the right combination of ecstasy and ardour. Also of note was her Nicklausse in the Barcarolle from Hoffmann. The Giulietta was Jacqueline Woodley, whose light soprano isn't what one would normally think of as Giulietta, but she did well, her voice blending nicely with Ferguson's. Saskatchewan native Ileana Montalbetti is familiar to Toronto audiences, as this represents her unprecedented fourth year in the Ensemble. Her's is a budding dramatic soprano with plenty of volume and a steely edge, ideal as Elettra and Vitellia, roles that she has sung at the COC. On this occasion, she teamed up with Emma Parkinson for a duet in Tito, and with Parkinson and Philippe Sly in the famous trio "Soave sia il veno" from Cosi fan tutte. Among the men, I was intrigued by BC tenor Isaiah Bell, who sang two solos and a duet. His is a light, sweet sound, with very good agility and a well supported upper range, making him ideal in Rossini. He sang Ramiro's aria from La cenerentola - a fiendishly difficult piece not for the faint of heart. He sang fearlessly and quite well, with all the money notes, only a hint of unevenness of tone in his passaggio notwithstanding. 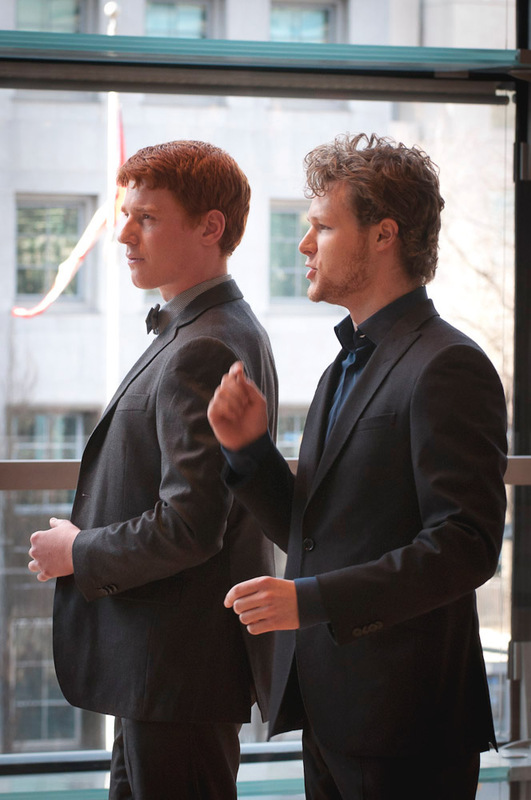 His duet with Philippe Sly in The Rake's Progress may not be the most catchy music for a recital program, but these two singers made it work. Baritone Philip Kalmanovitch, who opened the proceedings with an exuberant Largo al factotum, a piece that suits his irrepressible personality. He was also good in the very familiar "La ci darem la mano" with Jacqueline Woodley as a soubrette Zerlina. His Pierrot's aria "Mein sehnen, mein Wahnen" from Die tote Stadt is more a work in progress as it requires a steadier tone and firmer legato. There was no encore, but the singers were all well cheered by the appreciative audience, who can look forward to next year's Collaborations.